There are many reasons to teach the Weimaraner to swim! The Weimaraner has webbed toes, and can be trained to swim. Some Weimaraners will decide they don't like the water, but there is plenty of evidence that they can learn to adapt (and become a swimmer). Much of what they achieve depends upon their owner's ability to open the door to new ideas. If the concrete-thinking Weimaraner gets the idea that the water is not for them, it then becomes more work to get them into the water. The key to achieving the swim is the love of the retrieve. 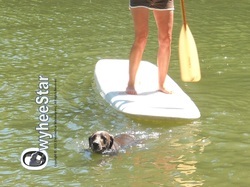 A retrieving Weimaraner can be eased into the water; it may take a knack to achieve this feat, but it more than doable. If the Weimar loves to retrieve, they can be trained to water-retrieve. The right type of training area is also important. A pond with shallow edges, and no water movement is a good starting location. You might get lucky, and the Weimaraner might dive into the water with no warning. More often than not, they are going to require coaxing. This takes a special knack, and a lot of patience. (Pictured to the right) Dyna and Dixie are at the pond for their first lesson. They are eyeing the bumper, and they want it. How badly do they want it? At first, they are not sure if they want to brave the w to get the bumper. Cliff achieved the swim for both Weims. The next step is getting them to enter the water on-command (without enticement). Swimming is the best exercise for the Weimaraner, but this is never truer than for the adolescent Weimaraner. That being said, there are many reasons to consider achieving the swim with your Weimaraner. Preventing damage to the young Weimaraner joints is the first that comes to mind. The rapid growth process will take your Weimaraner puppy from under ten pounds to be adult-looking in six months. That big bundle of paws and puppy activity needs an outlet. It is hard to remember they are still a puppy, when they look so much like an adult. It is important to keep in mind that growth (albeit almost undetectable in most cases) will continue until the growth plates close. The growth plates directly impacted by high-impact exercise are those located at the feet and leg juncture. Pat Hastings (dog structure guru) cautions that the growth plates are not fully closed until your large breed dog is at least two years old. There is a tip below on how to check the growth plates, but you may want to defer to your veterinary processional when making this type of decision. Experts disagree on how much exercise is too much. High-impact exercise (running and jumping) directly impacts the growth plates at the end of the legs. It is important to consider them, when engaging in longer runs, agility, and Frisbee-type exercise. Swimming has no negative impact whatsoever, but at the same time it burns off energy. It strengthens their cardio-vascular, while toning muscle. This is especially useful for the long-distance runner hoping for longevity with their running companion. Another activity that should be limited is stair climbing. Moderate amounts are OK, but running the stairs should be avoided for all the same reasons. No matter what the hip and joint quality is, the risk of suffering injury, or permanent damage is real. Tip: Pat Hastings describes how to check growth plate closure in the legs. She suggests you do this by running your fingers down either side of the foreleg, if you feel a bulge on both sides just above the "ankle," the growth plates are still open. (Doing assessment probably takes a knack and skill level the average person may not possess). OwyheeStar suggests (when in doubt) that you ask an expert for help. It is a given that you will not be able to tell by looking--you can only tell by feeling. The right diet, as well as the proper and age-appropriate exercise is equally important. The OwyheeStar Blog discusses this in more detail. To read the post--Click Here! The serious athlete tends to want to push the envelope, and rush things. This is not a good choice. It has been said a tired Weimaraner is a good Weimaraner. Swimming is the best way to achieve Weimaraner exhaustion, and at the same time; it is healthy for the Weimaraner no matter their age.